Editor’s Note – This Seedstock article has tips on how to prepare your spring garden no matter where you are in the country. This article was written by Brian Allnutt. In most areas of the country, the time for planting is near or nigh. Here are some reminders to help you begin to rev up the engine of your urban vegetable garden and keep it running smooth all season long. For beginning gardeners, it might be advisable to concentrate on doing this season and not thinking too much. There are many cases of frustrated gardeners trying to figure out what to do by reading books and reading articles on the internet like this one, when the best way to learn would be to volunteer at a community garden or urban farm. It’s much easier to contextualize these things once you have a little experience growing in the soil. One major exception to this advice is to make sure you test for heavy metals and contaminants before starting to garden in a new space, especially an urban space. We recommend reaching out to a trusted University Extension or urban gardening nonprofit to get advice on this, as well as knowledgeable neighbors. You can also check out this document for some information on potential contamination issues. Without further ado, here are some reminders for this month’s action steps. 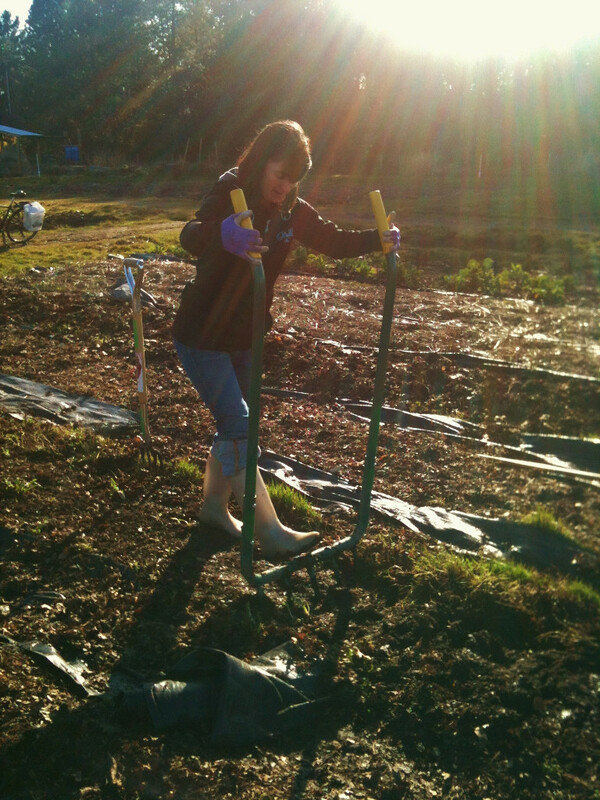 Step one is to use a broadfork for deep soil loosening (although a digging fork can also be used for this). Step two is using a three-tine cultivator for breaking up the top few inches of soil. Step three involves incorporating compost and bow rake or garden rake to gently comb out any large clumps of dirt or rock and make a nice even bed for seeding or transplanting. Alternatively you might use the Ruth Stout method of applying heavy layers of mulch, although you might still want to put some compost down under the mulch for the first few years. In this case start acquiring untreated straw or leaf mulch as soon as possible. It’s better to have too much than too little. 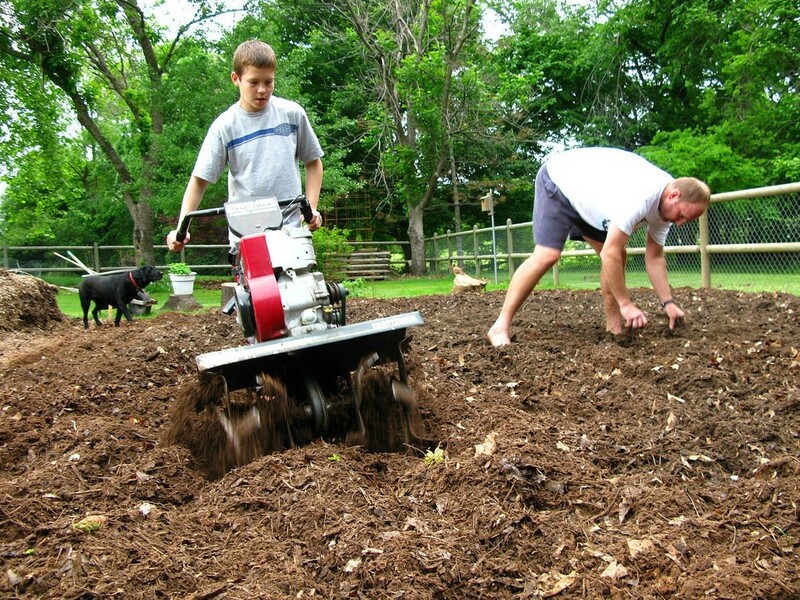 The Ruth Stout method is especially applicable to urban gardens where cultivation equipment may not be available, the soil may require major improvements and water is often in short supply. Stay on top of weeding, ideally with a long handled tool like a stirrup hoe, also called a scuffle hoe or a collinear hoe that allows the gardener to work upright with a straight back. Doing this once a week is an enjoyable and easy task that easily turns into a demanding chore if left for longer. Once the soil has warmed and dried sufficiently, start planting cold-tolerant plants, beginning with cool weather plants like spinach and peas. Transplant brassicas like kale, cabbage and collards as soon as the soil is in the 60 to 65-degree range. Water in the transplants with fish emulsion to help them get established. Wait until mid to late April for planting potatoes. These guys don’t want to get too wet, so plant them after the serious wetness of early spring. Mulching potatoes with straw is also a good way to protect the tubers, control weeds and avoid the need for much watering over the summer. Start tomatoes, peppers and eggplants indoors six to eight weeks ahead of your May planting dates. If you’re a little late don’t stress, there will still be plenty of time for them to catch up. You may wish to bypass planting the coldest weather crops, including broccoli and Brussel sprouts, as these will do a lot better as a fall planting than a summer one at this point in the year. Once the danger of frost has passed in your area, plant summer crops like tomatoes, peppers and eggplants as transplants. Direct seed summer squash, beans and cucumbers unless there are extenuating circumstances like pest pressure from cucumber beetles, in which case you can transplant these as two week old transplants. Avoid buying any transplants for summer fruit with flowers or fruit on them since this is a sign the plants are stressed and will probably not perform well. Fertilize as necessary. Compost can usually provide most of your plants’ nutrient needs, but if plants seem slow to take off consider applying a granular organic fertilizer or watering with fish emulsion. It’s important to do this now when plants are still in the growth phase. It’s important not to give fruiting crops too much nitrogen late in the season because this will encourage vegetative growth rather than fruit. Make sure to get supports for runner beans, tomatoes and any other vining or climbing plants in place well before they are needed. These plants like the summer itself have a way of inexplicably exploding on us before our brains have begun to register them. A little bit of forethought can go a long way in making sure you’re ready for the work to come.